Mother Teresa did not believe or proclaim the gospel of Jesus Christ as the only way of salvation. She encouraged Hindus, Muslims and Buddhists to be better Hindus, Muslims and Buddhists. She never pointed people to Christ as the only savior, mediator and redeemer. Instead she taught a bizarre ‘pseudo-pantheism’ in which she believed Jesus was present in everyone. Agnes Gonxha Bojaxhiu, also known as “Mother Teresa,” was declared a venerated saint on Sunday after she met the Vatican’s requirement of being credited with the purported healing of two people through what Roman Catholics believe is her intercession in death. 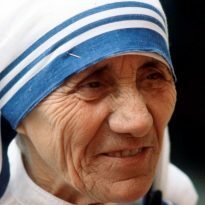 “[A]fter due deliberation and frequent prayer for divine assistance, and having sought the counsel of many of our brother bishops, we declare and define Blessed Teresa of Calcutta to be a saint, and we enroll her among the saints, decreeing that she is to be venerated as such by the whole church,” Jorge Bergoglio, also known as Pope Francis, declared at the Vatican before an estimated crowd of 120,000 people on Sunday.